There’s absolutely no excuse these days for not knowing how to avoid a data roaming bill. In just two short years, the range of prepaid SIM cards available to travellers has exploded, dramatically lowering the risk of a shocking data roaming bill. In this past, even the most-prepared amongst us have been stung by the poor infrastructure and billing arrangements between carriers. The best way to avoid a global roaming bill is by using a local SIM card. The main drawback to local SIM cards is highlighted in a place like France. Let’s say you are holidaying in France and want to head to Italy for a period of time. If you’re out of reach of the French mobile network, your phone now needs to roam, or you need an Italian SIM. Fortunately, there are some reasonable compromises. Some SIMs (like the VeloNomad French SIMs) offer inter-country roaming for cost-effective rates. This means you can add an amount of data for the required period of time, without the need to buy a second SIM. This is really useful in the EU, where it’s easy to get to other countries and where you might be moving around a lot on a holiday. Data roaming caps seemed to be a fair compromise about 2 years ago, but were fraught with danger. Since I was on Telstra (for those international readers, Telstra is the ants-pants, rolled-gold mobile phone carrier in Australia. More expensive, but very fast 3G/4G everywhere), I signed on to their $160 for 60MB of overseas data plan. I thought that for 2 weeks, 60MB would be plenty of data, given we were staying in one place and had Wifi. Last year, I used around 200M, and was constantly on Twitter and Google Maps. Before I left, I reset my iPhone data usage stats to 0MB. I turned all my email data push and app push notifications off. This meant data would only be downloaded when I specifically asked an app to do so. When I got home I’d used 61MB according to my iPhone, so I expected excess usage charges for 1MB. Imagine my surprise, then, when I received a bill for $1900. My SMS and calls added up to AUD$400 but my month-and-a-bit of international roaming was $1400, so Telstra was telling me I used $1300 (around USD$1100) of excess data (around 130MB). No way. When I looked at the bill, the data usage had been reconciled into minutes/seconds, with some calls showing 394 minutes. Clearly something was awry. I rang Telstra, telling them that I thought the bill was erroneous, and if they couldn’t reconcile the bill into data (bits and bytes, not minutes and seconds), then I clearly couldn’t confirm the accuracy of their bill. They told me this was all they received from the overseas carriers. 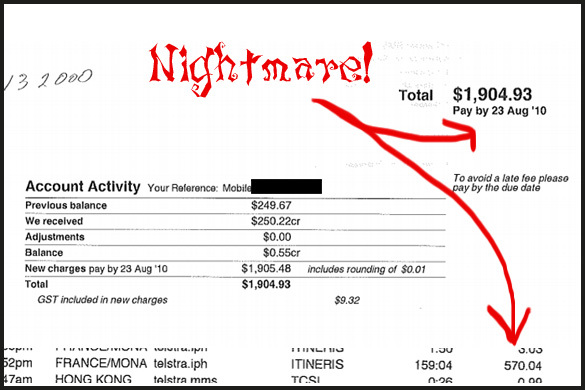 Happily, Telstra saw the folly of the situation and wrote a significant portion of the bill off. It covers a big range of countries including cycling destinations France, Spain, Italy, Switzerland, USA, Germany, Netherlands, Belgium and many more. You need to have a monthly plan: this offer is not available to prepaid customers. And to be honest, who wants to be on the Vodafone network in Australia? Not me, because it’s terrible. It’s still very expensive: for a 21 day trip, you’re looking at $105, assuming you use your phone every day. Having said that, depending on which countries you’re going to, this might be a good deal. Here are some other work arounds to help you avoid a data roaming bill. Use Wifi where available: this isn’t ideal as you can’t Tweet pix from the Alpe d’Huez to your mates to make them insanely jealous. You also won’t find Wifi everywhere though this is less a problem in Asia than Europe. Only periodically use the Internet: you’re on holiday, so enjoy it! This obviously isn’t an option for a lot of business people.